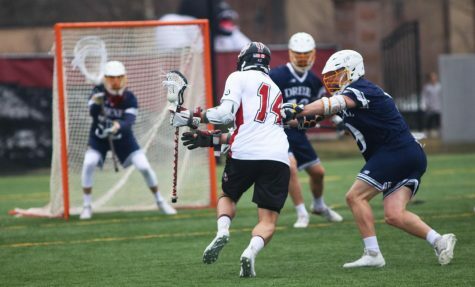 When senior Ryan Hantverk knotted the score at eight apiece with one second left in Sunday’s game against Towson, the No. 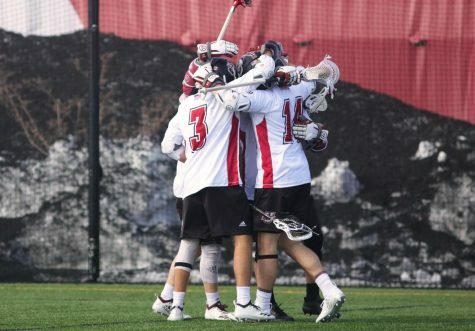 18 Massachusetts men’s lacrosse team was thankful just to remain alive in the game. 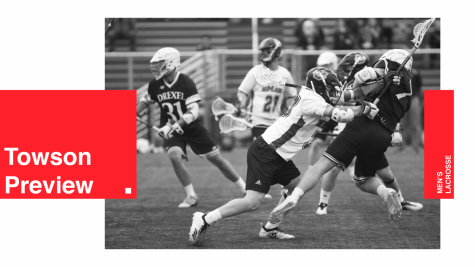 With one minute, 55 seconds to go in the overtime period, the Minutemen grabbed the victory with a late-breaking score by Kyle Smith, winning 9-8 against their Colonial Athletic Association foe. The match featured strong individual performances as well, despite the Minutemen calling it a group effort following the game. Though Smith and Hantverk will be remembered as the men who secured the victory, sophomore Will Manny provided an impressive offensive effort, tying his career-high in goals with four. Manny’s goals kept the Minutemen (7-3, 2-1 Colonial Athletic Association) from trailing significantly throughout the game. 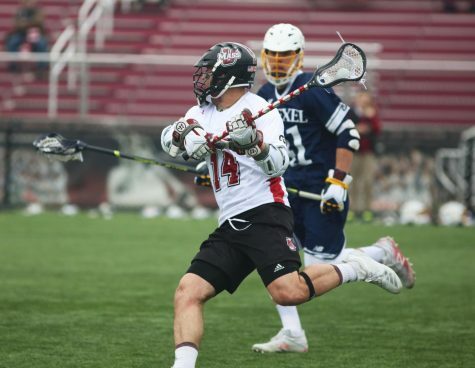 When the Minutemen found themselves down by a pair to the Tigers (2-8, 0-3 CAA), Manny sent in two scores that cut the lead back to one – which allowed Hantverk to score his game-tying goal 2 minutes and 39 seconds later. Both teams notched 32 shots over the five periods of play and differed by one in successful face-off attempts, with the Tigers gaining the advantage. 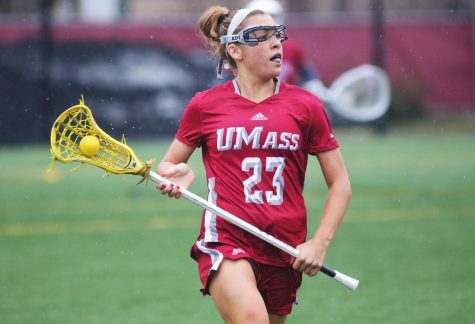 UMass started off the contest with two goals in the first quarter and held the Tigers scoreless. Unassisted goals by Manny and Art Kell in the opening nine minutes gave the Minutemen their first quarter lead, a time period during which they’ve struggled to produce offensively. 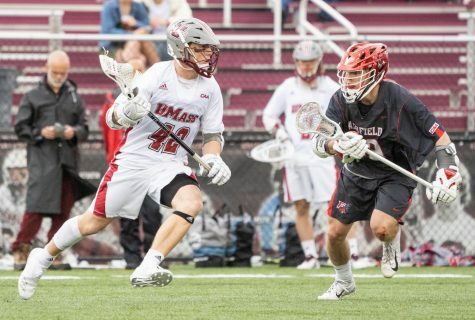 Although TU came right back in the second quarter with goals from Andrew Hodgson and Tim Stratton, UMass stormed into the picture again with two straight goals from Ryan Hollenbaugh and Greg Rushing, who came back last week after being out with an illness. After the teams traded goals in the third, one coming from Manny and the other coming from Towson’s Matt Hughes, the Tigers opened up the Maroon and White defense for a 4-0 run that featured another goal for Stratton and two straight scores from Pat Britton. Down a pair, Manny worked his magic to cut the lead on two separate occasions before Hantverk’s game-saving goal and Smith’s eventual game-winner. 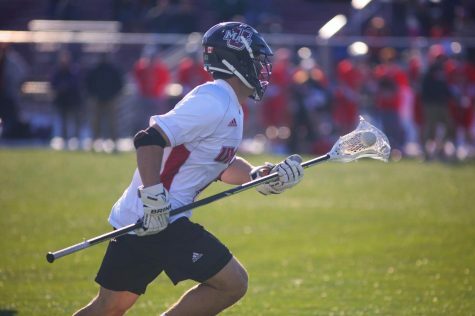 Though he didn’t score a goal, Anthony Biscardi provided some offensive moves that kept the Minutemen in the game, notching two assists and a groundball. The Tigers picked up 11 more groundballs than the Minutemen over the course of the game. Tim McCormack didn’t play at his usual level, making 10 saves with eight goals allowed. 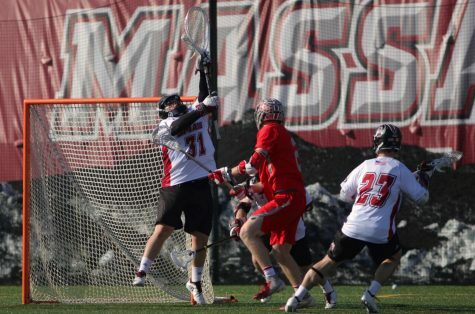 Meanwhile the Tigers’ Travis Love secured 13 shots while allowing nine goals. With the Tigers out of the way, the Minutemen finish off a two-game road series which began with a win at St. Joseph’s, as they return back to Garber Field next Saturday to take on Drexel. 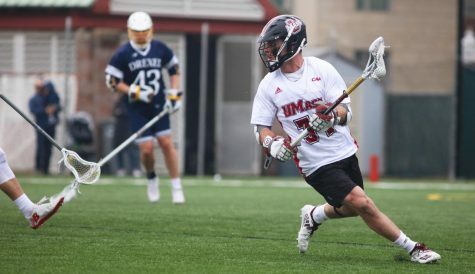 Following the Warrior Classic against Hofstra to be played at Rentschler Field in Hartford the following week, UMass will complete its regular season schedule against Delaware at home.